I love a creamy, Tex-Mex style one skillet meal. 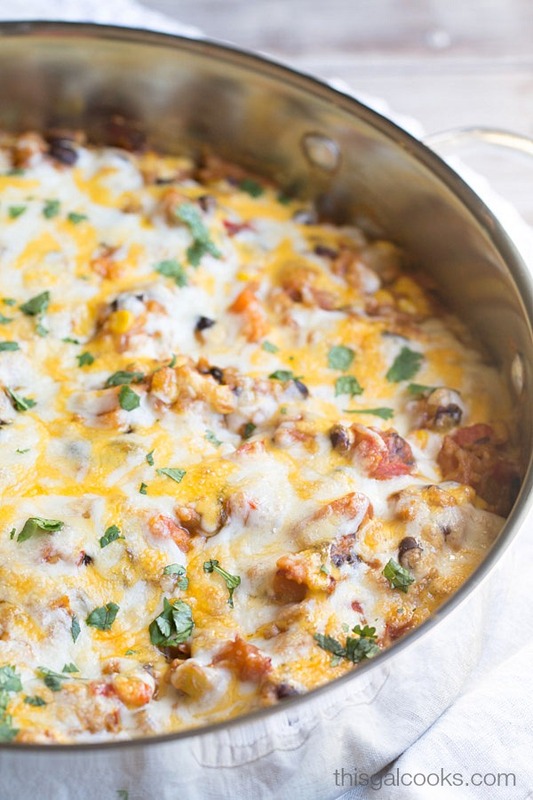 A while back I made this Easy Beef Tex Mex Skillet Casserole. 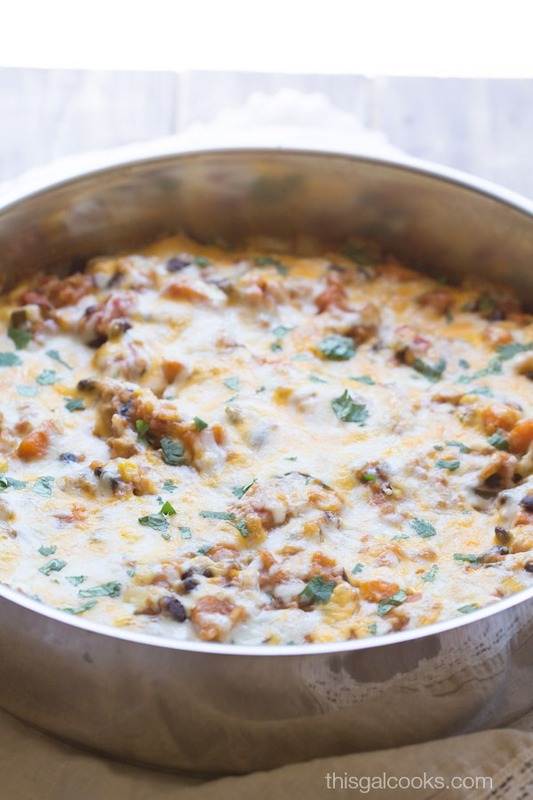 A vegetarian skillet meal was long overdue so I made this Sweet Potato Enchiladas Skillet Casserole. I used RiceSelect Arborio Blend™ with Jalapeño in this recipe. If you love a little heat in your food, you will enjoy the creaminess and slight heat that comes with this blend. It pairs well with the soft sweet potatoes, the zucchini, sweet corn and the black beans used in this dish. RiceSelect is my go to rice brand. All of their products are non-GMO and are grown, milled, and packaged in the USA. I’ve used many of their varieties in my cooking, such as the Texmati® White Rice and Royal Blend®. And I love that I can purchase RiceSelect products at the grocery store or from the comfort of my home. This dish was so EASY to make! Everything is cooked in one oven-safe skillet. Saute some sweet potatoes with a little olive oil. Add the rice, black beans, corn, enchilada sauce and chicken stock. Use vegetarian stock, if you prefer. Cover and cook until the rice is tender. Then, top with cheese and broil until that cheese is ooey gooey and bubbly. Enjoy. Heat a large skillet over medium high heat. Add the sweet potato and drizzle with the ½ tbsp of olive oil. Saute for 5 minutes. Add the zucchini, red chili peppers and chipotle peppers and saute for 3 minutes. Reduce heat to medium low and stir in the rice. Cook for 1 minute, stirring often. Add the enchilada sauces, water, diced tomatoes, diced green chilis, black beans and corn. Mix well and bring to a boil. Cover and reduce to a simmer. Simmer for 18-20 minutes, or until the rice is tender, stirring occasionally. Once the rice is done cooking, stir in the 2oz of cream cheese. Top with the shredded cheese and then turn on your broiler. Broil until the cheese is bubbly. Garnish with cilantro, if desired. Ready to start cooking with RiceSelect? Visit the RiceSelect Rethink Rice campaign site to sign up for their monthly newsletters and access to fresh new recipes. You’ll receive a $2-off coupon just for signing up! You’ll also be able to enter to win a 6 cup Aroma rice cooker. Trust me, I’m sure you will love your rice cooker as much as I love mine! For another opportunity to win, answer the question, “What’s your favorite rice recipe?” in the comments below for a chance to win a $100 Amazon gift card. This sweepstakes runs from 10/6/14 – 11/3/14. Be sure to visit the RiceSelect brand page on BlogHer.com where you can read other bloggers’ posts! My favorite rice recipe is my mother’s arroz con pollo. My favorite rice recipe is veggie fried rice. You have made some darn good risotto recipes, Carrie! You would love this jalapeno arborio rice. Mmm, I’m thinking about your beer bacon risotto and I think it would be great made with the jalapeno risotto! 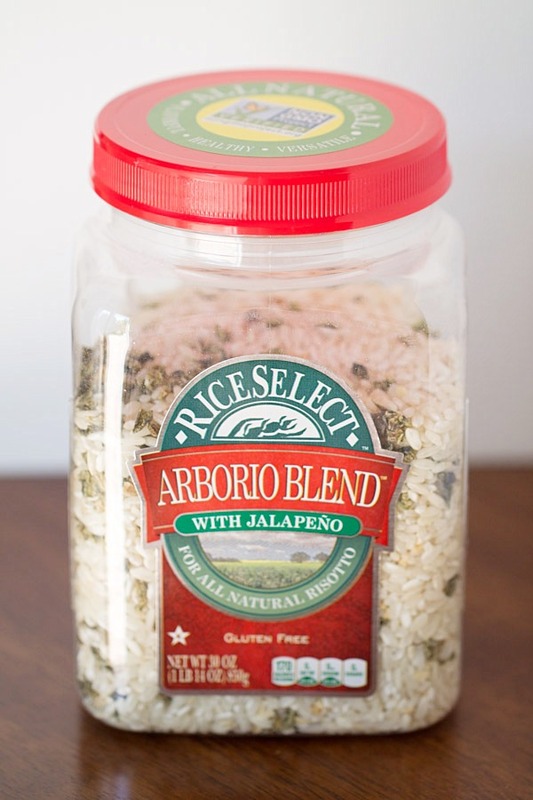 That is my FAVORITE brand of Arborio rice and I have never tried it with the jalapeno. Had no idea that existed and it’s on my grocery list now. My favorite rice recipe is my creamy mushroom risotto. Thanks for the giveaway! This looks so delicious, Julie! Pinned! You’ve GOTTA try it, Claire! It’s so good. Plus, I heart jalapenos so this rice is PERFECT!!! Also, I would gobble up all of the mushroom risotto. YUM! This looks delicious! My favorite rice recipe is for Mexican red rice!! I love homemade Mexican rice! Like what you get on the side of your food at a Mexican restaurant. It’s so good and easy to make at home. I love this idea of an Arborio blend that is seasoned, so clever. And I’m sure your recipe would be a new rice favorite in my house hold! OH I LOVE the Mexican rice too, Meggan! I may have to hit up my favorite Mexican restaurant for lunch tomorrow so I can get some! I love all your skillet recipes! They are so delicious and flavourful! What a great dish for fall… so warming and comforting. Oh my gosh! Love this recipe Julie! And that arborio rice with jalapenos is genius.. I bet this is creamy and spicy and absolutely delicious! I would lick my plate after it for sure! Thank you, Krista! You’re right, the arborio with Jalapenos IS genius! I LOVE sweet potatoes with spice, too! I’ve done sweet potatoes stuffed with taco meat, beans, cheese, salsa and sour cream. SO good! Thanks for stopping by, Allie! My favorite rice recipe is cheesy rice with fresh cut broccoli. My kids also love it! My favorite rice recipe is creamy chicken and rice with cream of mushroom soup. I love making fried rice with leftover white rice, fried egg, soy sauce and lots of fresh veggies. Yum! Love all your skillet meals and this one is so creative! We are crazy about enchiladas and sweet potatoes and so combining the two and using rice sounds perfect! My favorite rice recipe is Acorn Squash with rice, black beans, tomatoes, spices. Yumm! Everything about this meal is calling my name! Sweet potatoes, rice and that cheesy goodness look delicious! I definitely need to try the Arborio with Jalapeno blend. It’s really good, Ashley! I’m glad I was able to try the Jalapeno blend. Wow, Julie, this looks fantastic. I’m going to have to give this a try. Sweet potatoes are one of my favorite foods. 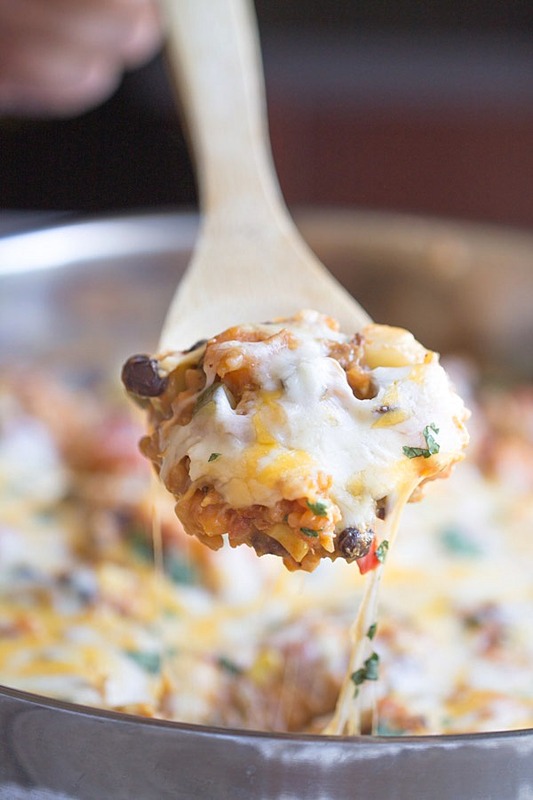 I could definitely devour a massive bowlful of this enchilada casserole right now.. WOW it looks delicious. Love that you used a skillet too, I love cooking in mine so this recipe is perfect for me! I’ve seen this rice on some other blogs, but your way of cooking it is very original and looks extremely comforting and delicious! Enchilada casserole in a skillet, it is a must try!!! I love to make a hearty beef stew and serve it over rice. This looks so delicious! All that melty cheese on top is just divine. I can’t wait to make it! I like arroz con pollo. Yum! I make a bacon/chicken/broccoli/rice casserole that my family loves. My favorite rice dish is Avocado Shrimp Risotto, and I even use Rice Select Aborrio Rice. ;) This dish looks amazing Julie, I can’t wait to try it!! OMG! Avocado Shrimp Risotto sounds AMAZING, Lisa! Julie this skillet meal looks great. I can’t wait to try the rice with jalapeños. My favorite rice dish is fried rice or stir fry. I like cilantro lime rice! You’re welcome, Ginnie! Thank you for stopping by! This is my kind of dinner! Thanks for linking up with What’s Cookin’ Wedesday! My favorite rice dish is Seafood Paella. Thank you for the opportunity to enter. My favorite rice recipe is Spanish Rice. I love Matsutake Gohan ( Matsutake mushroom rice). i like Fried Rice with egg. This looks SO good girl! Thanks for linking up with Show Stopper Saturday! I like to make fried rice with leftover meat and/or veggies. Thanks for this recipe. My family thinks rice is a requirement several times a week. 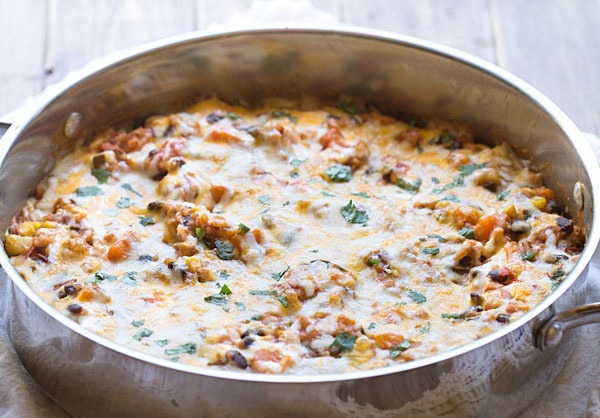 I just tried this Sweet Potato Enchiladas Skillet Casserole. We loved it – even the veggies. Now I have a new favorite dish – and all in one pan. We really enjoyed this recipe. Don’t know why my pc would not let me put 4 stars, which this recipe deserved! I love making homemade pork fried rice, just like my favorite Chinese place!! You’re welcome, Gina! Good luck! My favorite is definitely mushroom risotto. I don’t do much with rice but I do love Mexican rice. I would so love to try your recipe, it’s looks really good. I love the chicken and rice casserole my mother has made but I also love chicken and wild rice soup. I love rice pudding with golden raisins! My favorite Rice recipe is my homemade Spanish Rice that my family just loves! 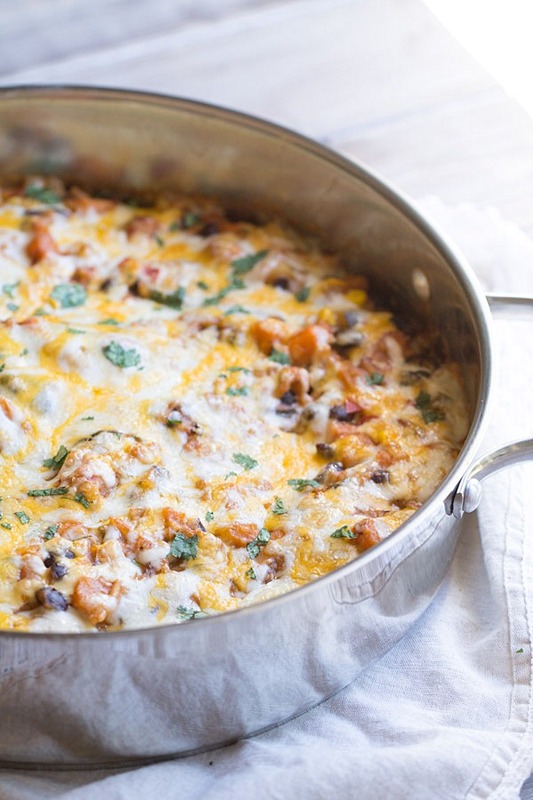 i am looking forward to trying the sweet potato Enchiladas skillet casserole. it looks great! I hope you enjoy the recipe, Sharon! I make a mean homemade chicken fried rice recipe. My favorite rice side dish is simple to make in my rice cooker, but it’s really tasty, and it depends on good rice. I soften chopped onions in a bit of oil with a dash of salt, then stir in the rice. Then comes the water (and/or stock). A little dried thyme at the beginning or fresh thyme toward the end, and it’s a great basic but flavorful side. It’s also easy to change up the flavoring to match the main course, too. I find myself making rice pilaf a lot to round out a meal. Everybody loves it with garlic, onions and herbs. My favorite rice recipes is Spaghetti Rice Stuffed Green Peppers! I cook the rice and hamburger, and then mix with spaghetti sauce and mozzarella cheese. I stuff the peppers and put extra sauce on top. I cover with foil and bake for 45 minutes at 350..then take off the foil and put a little extra cheese on top. One of our families favorites! My favorite rice recipe to make consist of hot rice, sauteed garlic, and lots of freshly chopped green herbs. Cheesy chicken and rice casserole! But your recipe looks AWESOME! My favorite rice recipe is beef tips and rice. I like to make rice with chicken. My favorite rice recipe is fried rice, but your recipe could make me change my mind. It looks and sounds wonderful. My favorite is pork fried rice. My favorite rice recipe is jambalaya – a tradition here in the south. I like to cook rice in water with beef bouillon cubes. Then I add cooked hamburger, corn and green beans to it. My kids LOVE it! I loved this. It was pretty easy to make, just worried that it wouldn’t all fit in my 11 inch skillet. Might do a bigger pan next time to be safe, but will be making again and again! I would suggest using the Rice Select plain arborio rice and then adding a fresh chopped jalapeno to the skillet along with the zucchini, red chili peppers and chipotle peppers (step 2). This looks absolutely delicious! Thank you for the recipe. i’ll have to try this myself sometime soon!